Jordan Rapp has raced triathlon professionally for the past 10 years. He is the 2011 ITU Long Distance World Champion and a six-time Ironman champion, and holds a mechanical engineering degree from Princeton University. Upon first glance, the Andean seems like a bike designed to do one thing and to do it very well – go really fast in a (mostly) straight line. This was my own impression as well when I first got on the bike, though I suspect that more of that than I realized was informed by frame sizing. Due to production scheduling, I was on an XL frame to start the year. The XL frame has more stack and reach than I prefer, which manifested itself in some seemingly small (but in hindsight more significant) changes in hand-position due to needing to use different extensions than I was used to. But the big change in feel came from the difference in front-center. Front-center is – in my experience – the single most critical impact in terms of whether or not you like how a triathlon/TT bike handles (it’s less critical for road bikes). Stack and reach – and in particular reach – determines how a tri-bike fits. But that’s only part of the story. I have ranges for both stack and reach that put me in my sweet-spot. The first is a range of 410-425mm for reach. I’ve ridden bikes with less reach than this – I had to ride a size medium Specialized Shiv Tri (reach 405). But I don’t like it. And really, within that range, 415-420mm is preferable to me. 410-425 is “good enough.” 415-420mm is ideal. Within this range, I end up with a stem that provides appropriate handling characteristics and my elbow pads end up in the right spot. The Andean in XL has a reach of 430. The Andean in L has a reach of 415. Stack: the vertical distance between bottom bracket center and upper headset bearing center. Reach: the horizontal distance between bottom bracket center and upper headset bearing center. It was easy to figure out the reach I liked best, because I have had a pretty immutable set of fit coordinates for some time now. Reach is more imperative than stack because stem length affects handling in a way that stem height (or pedestal height for elevated pads) does not. But stack is still important from a comfort standpoint. On the stack side, I like anywhere from 530mm to 550mm, though mostly I just need a stack that allows me to use an aerobar I’m comfortable with. For most of the start of my career, that was the original Zipp Vuka Aero (2008-2012). Since late 2012, it was the Zipp Vuka Stealth. There are four fundamental aspects of bar geometry that matter to me. One is the horizontal reach to the brake hoods. The second is the vertical drop to the brake hoods. The third is the position of the elbow pads. And the fourth – and overwhelmingly most important – is the vertical and angular position of my hands relative to my elbows. I’ve ridden 40deg ski-bend extensions for 10 years now. I’m just not going to change that. I’ve tried others. I just can’t do it. Maybe if I was a young’un again. But not now. Because of this, I need the extensions to mount basically right underneath the elbow pads. I like my hands to be up high. But not too high. Mostly, I just want them to be the same as they’ve been. The Andean in L has a stack of 543mm; the XL is 568mm. The XL was always going to be a bit large for me, but I knew with some creativity, I could get my elbows – but not my hands – where they needed to be. I had to compromise on hand position – something I thought I was more comfortable with than I was until I switched back to my old setup on the L. But I didn’t realize how much my impression of the bike was to be affected by front-center. Part of this is a lack of direct comparative experience. I’ve never ridden the exact same bike in two different sizes before. But doing so, I realized just how critical front-center is to my experience. Front-Center: the horizontal distance between bottom bracket center and front axle center. Trail: the horizontal distance between a point dropped straight down from the front axle and a point projected along the angle of the fork. For those of you scratching your head, let’s talk about exactly what front-center is. Front center is the distance from the center of the bottom-bracket to the center of the front-wheel axle. As a quick aside, trail goes hand-in-hand with front-center when it comes to defining ride quality, but trail typically does not change within a given bike model, whereas front-center does. For more on trail, read on. Trail is defined by fork-rake and head-tube angle, both of which also play a huge role in bike handling. However, fork-rakes and head-tube angles vary less, especially with TT bikes, than front-center numbers do. The industry has pretty well coalesced around 72.5deg for head-tube angle. And fork rakes (aka offsets) of 45mm. Because of this, front-center is the only thing that really changes a lot and so it’s really become a proxy for “this is how this bike rides” in my mind when it comes to bikes with aerobars. Fork Rake (Offset): The horizontal distance between a point centered along the steering axis and the actual center of the front axle. Adding offset decreases trail, which makes handling more nimble or more nervous (depending on your perspective). This is the reflected by the gap between the circles. Head Tube Angle (Steering Angle): the angle at which the fork is pitched. Reducing (slackening) head tube angle increases trail. Front-center impacts weight distribution – more front center will reduce the proportional amount of weight on the front wheel – which has a huge impact on handling. 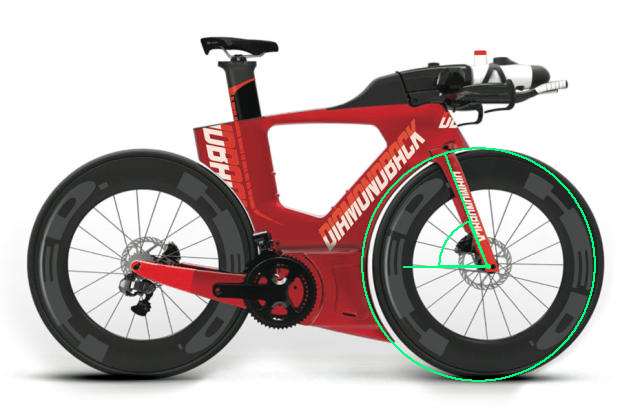 Without devolving too much further into the nuances of bicycle and motorcycle geometry, for a TT/tri-bike – where your weight is overwhelmingly on the front wheel – front-center is much more impactful than it is on a road bike. And, conversely to what you might expect, just because more front-center alleviates weight on the front-wheel, it doesn’t necessarily make handling better, it just makes it more predictable. This is neither good nor bad. It just is. And it’s goodness or badness depends on the type of riding you like to do. And how you are positioned aboard your bike. For me, a bike with 610-615mm of front-center is ideal. This is part of why I was happy on the Specialized Shiv Tri in size medium – this has a front-center of 609mm – but the Shiv TT in size L – which I had ridden before and which has a front-center of 616mm. These bikes are actually, because of this, closer than they might seem when looking at stack and reach numbers. The Andean in XL has a front-center of 637mm, which is by far the most of any bike I’ve ever ridden. The L, on the other hand, has a front-center of 614mm, right exactly where I am happiest. This made a huge difference in one particular aspect that proved critical to enjoying the Andean out on the road – ascending. When you climb, you automatically have more weight on the rear wheel. As a result, a bike with an overly long front-center ends up with an overly light front end that makes the bike feel like a dog when climbing. The Andean in XL felt biggest when I would climb on it. Given that the Andean is a relatively heavy bike for aerodynamic reasons, it was easy to think that it was not a good climber. But it was not because of weight. It was because of geometry. 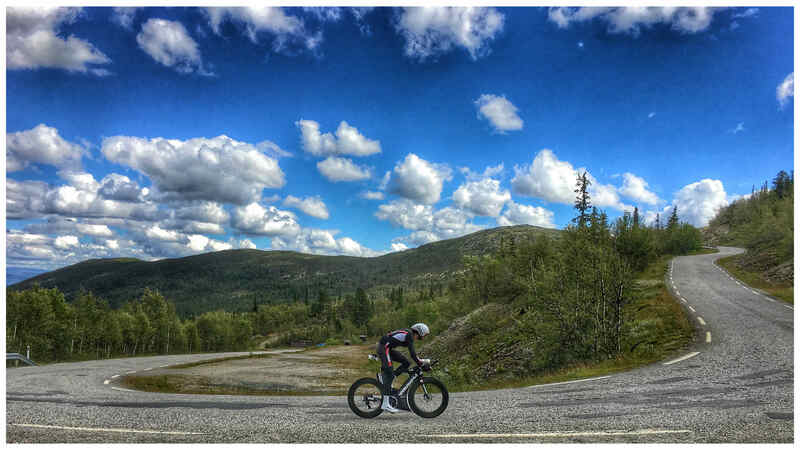 Reconnoitering one of the Norseman climbs pre-race on my Large frame. The Andean in size L is not appreciably lighter. But it does have appreciably less front-center. This gives it a more typical weight distribution that makes the bike feel a lot lighter when climbing. In my experience, when people talk about a bike that climbs well, they think they are talking about weight, but what they are really talking about is weight distribution. Bottom bracket stiffness also plays a role (more so, in my opinion, than torsional stiffness, unless you are standing, which you shouldn’t be doing much of in a triathlon), and I think this is why the Andean – as a bike – is more enjoyable to climb with than its weight might imply. 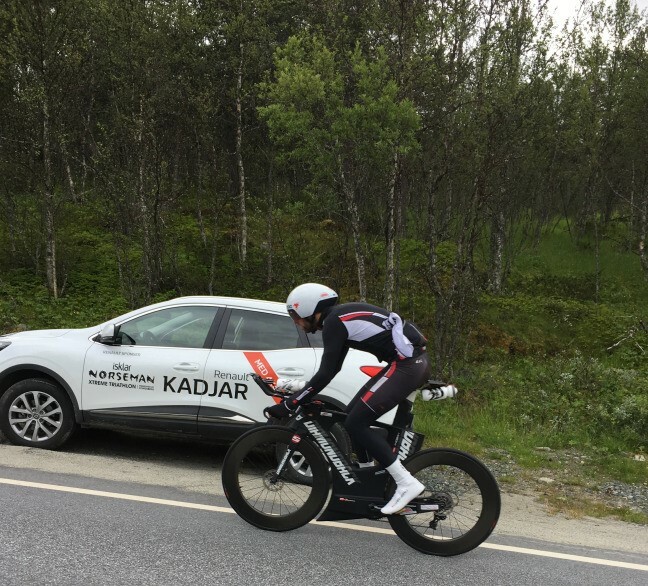 When I was riding the XL I had some initial reluctance about taking the Andean to race Norseman. But after switching the L, that ambivalence disappeared. The roads around where I live – and I do most of my TT bike riding heading northwest, into the Santa Clara River Valley – are rolling. The Andean had always been great on the flatter roads along the coast. If I lived in the Midwest, it still might be my preferred size. It’s extremely stable on straight and flattish roads. But when I took it inland - and up - it wasn’t until I was on a size L that I was happy. On a size L, the Andean became a bike that could do it all, in terms of tri courses, that is. Because the Andean is a big bike, that’s relatively heavy and which has a fair amount of surface area, I think it’s more sensitive to sizing properly than other bikes. I really value that I got to ride the XL because the experience of riding the exact same frame in two different sizes drove home what had formerly been an overwhelmingly academic understanding of bike geometry. I liked the Andean in XL. But I really love it in size L.
Diamondback has recently introduced an updated fit calculator designed to help users pick the right size frame. If you find yourself between sizes, I hope that understanding how the difference in geometries unrelated to fit affect the riding experience can help you make the right choice. The Andean is a great bike that really go fast on any course. Words by Jordan Rapp, main photo by Halvard Berg.